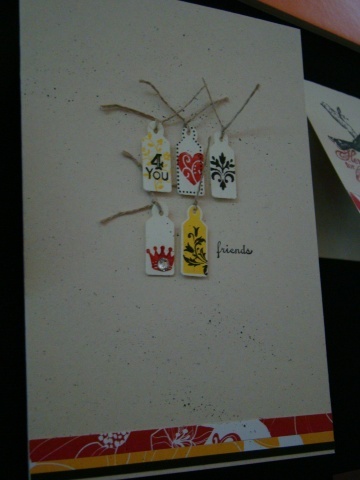 Here is another Forever Young card. I borrowed the stamp set from a friend, Christie Wallace (you can check out Christie’s amazing creations here), and had a play with it – lucky me! 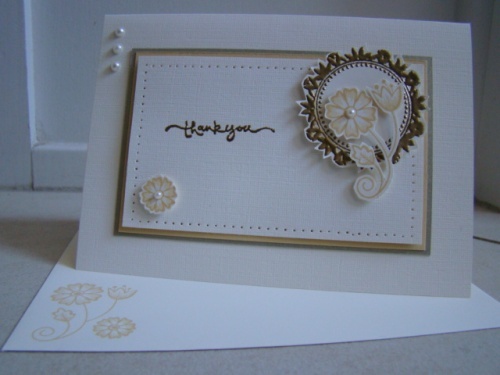 This card also uses the embossing technique. 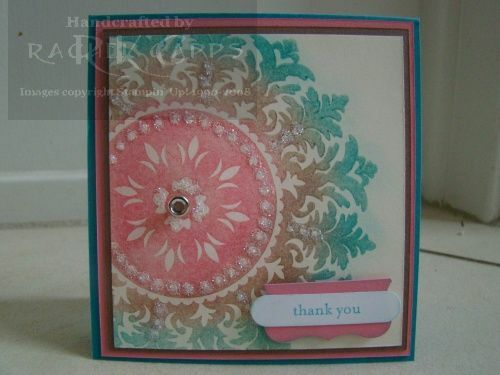 I stamped in versamark and then heated black embossing powder over the image. 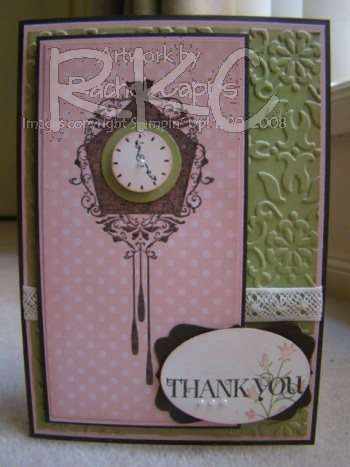 The colours I’ve used are Whisper White, Basic Black, Basic Gray and the Neutrals Collection of the Patterns DSP Stack. 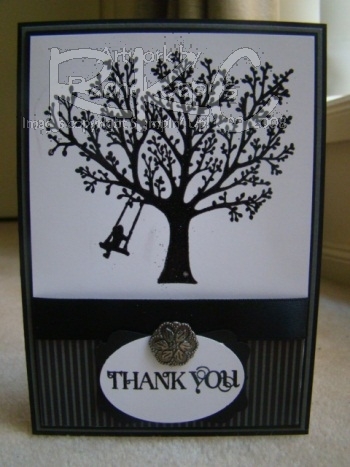 The sentiment is stamped from the stamp set Curly Cute which fits perfectly in the Extra-Large Oval Punch and is layered with the Decorative Label punch. 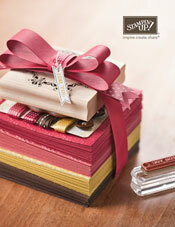 There is a touch of SU Basic Black satin ribbon and, of course, a gorgeous Vintage brad to finish the card off. 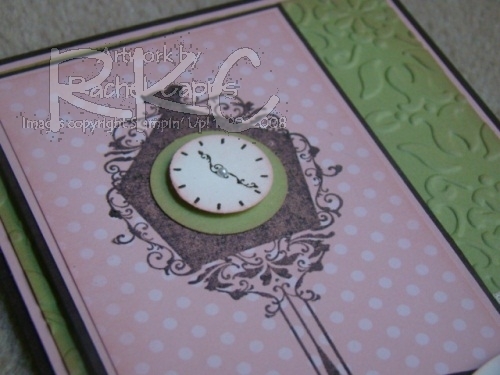 I used the layout from another card I’ve made before here, and then I used colours that were closest to the bride’s bridesmaid colours to help coordinate with her wedding theme. I used Very Vanilla (textured), Brushed Gold and So Saffron card stock and So Saffron and Versamark ink. The stamp sets I used are Together Forever and Short & Sweet. Sadly, Together Forever won’t be available after the end of this month – so now is your last chance to buy it if you love it! I must admit, I’ve loved using it. It’s so versatile! 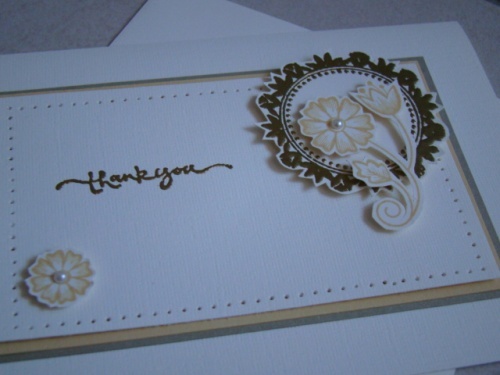 Thank you cards, birthday cards, wedding cards etc. You can see in the close up that I’ve embossed the sentiment and frame with gold embossing powder, plus I paper pierced a border in the centre frame and I’ve added some elegant pearls. 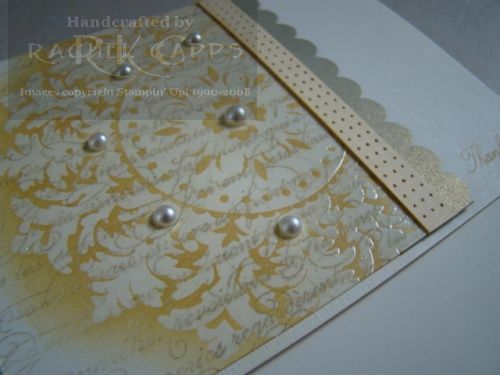 Pearls are lovely on wedding cards, don’t you think? I’ve more cards that are part of this wedding theme – so check back over the next few days to see what else I’ve created for my friend – the soon-to-be beautiful bride!